Keep hard boiled and peeled eggs aside. Mix water, milk, onion soup powder and curry powder together in a saucepan. Bring to the boil over medium-heat while stirring frequently to avoid lumps forming. When the mixture starts to boil, lower the heat and simmer for 5 minutes, stirring frequently. Cut the hard boiled eggs in halve and place on a bed of rice, pap or cous cous. 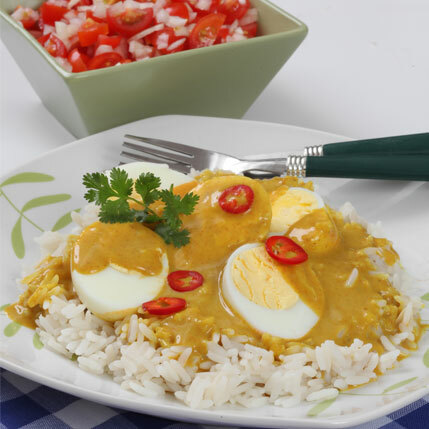 Pour the hot curry sauce over the egg halves. Garnish with coriander leaves and chopped chilli (if desired). Serve immediately accompanied by a chopped tomato, cucumber and onion salad (optional). Replace milk with coconut milk or cream for a richer and creamier curry sauce.